This statue by Jules Déchin can be seen on the Cours Xavier Arnozan in Bordeaux. Jeanne d’Arc was born in 1412 and travelled on horseback through a large part of France to mobilize the French against the English occupiers. During the years 1429 and 1430 she rode 5329 kilometers, as was reconstructed by L. Champion in his book Jeane d’ Arc Ecuyère, Paris 1901. By then she was 17 and 18 years old. The artist has well rendered her youthful expression, even with all her armor. She holds the flag and the four reins in her left hand and the sword in her right one. She looks enthousiastic and has complete control over her horse. Her determination is visible in all details of this statue. 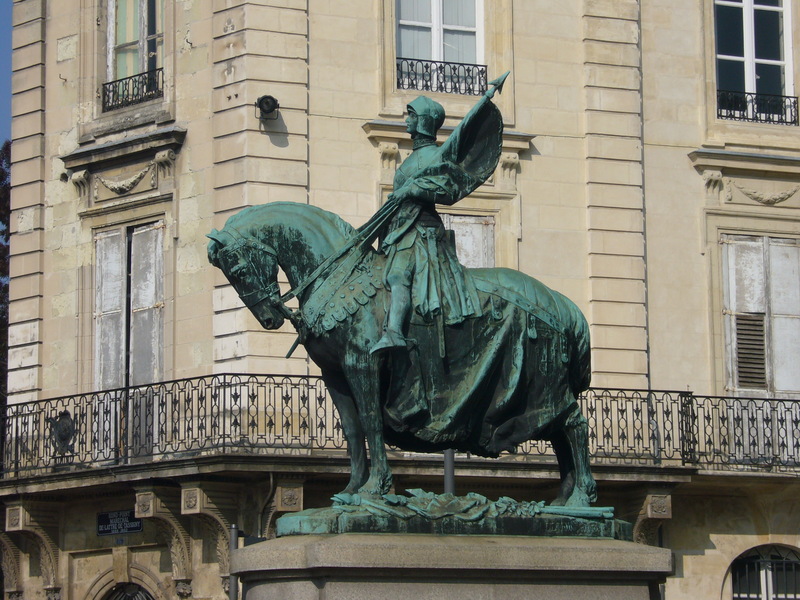 It is a copy of the statue in Quebec, for which the Comitée Jeanne d’Arc in Bordeaux raised the funds. The inauguration was postponed until 1950, due to the second world war. She was canonised in 1920 and in France the second Sunday of May is a national holiday.